This impressive antique brooch is very probably the same jewel listed in the Boucheron inventory of the jewels of Countess Henckel von Donnersmarck (La Païva) dated 19 December 1882 and described as 'a brooch of a square emerald surrounded by diamonds'. Esther-Thérèse Lachman, Marquise de Païva (from 1851 untill 1871), then Countess Henckel von Donnersmarck (from 1871 until her death in 1884), is definitely an exception. Her love of fine jewelry was such that she would frequently buy stones on paper, and not one at a time, but 10 or 12. The next day, on the 28th of October, the Countess was back at Boucheron to order settings for all theses stones. The three enormous emeralds were set on a bracelet in the shape of a trefoil. For the setting alone, the Countess paid an additional charge of 745 francs. Even more fascinating was the diamond and ruby rivière which she ordered at Boucheron on that same day. It contained only 25 stones: 12 diamonds of 7 carats, and 13 rubies of an amazing 103 carats. This jewel, of very simple design, must have been the twin (albeit slightly smaller) of the emerald necklace offered here for sale as lot 396. Between the years 1878 and 1883 (she had left Paris in 1878 and died January 1884 at Neudeck Castle in Prussia), Countess Henckel von Donnersmarck spent 100 000 francs every year at Boucheron. One of the most important jewels she ever bought was a diamond collerette of triangular shape, ordered 19 June 1878 sur le modèle de celle présentée à l'’Exposition Univerelle. For this stunning piece of jewellery she brought 207 of her own diamonds to which Boucheron added 220 brilliants and 526 rose-cut diamonds. This diamond collerette was later transformed into a tiara, with a removable pearl surmount, for Princess Katharina, the second wife of Count Henckel von Donnersmarck. It is this tiara wich the Princess is pictured wearing on p. 335. Even more fascinating is an entry in the Boucheron archives which dates to 19 December 1882. Countess Henckel von Donnersmarck brought to Boucheron 22 pieces of coloured jewellery, mainly emeralds, rubies, saphires and turquoise, in order to have boxes with steel corners made especially for them. 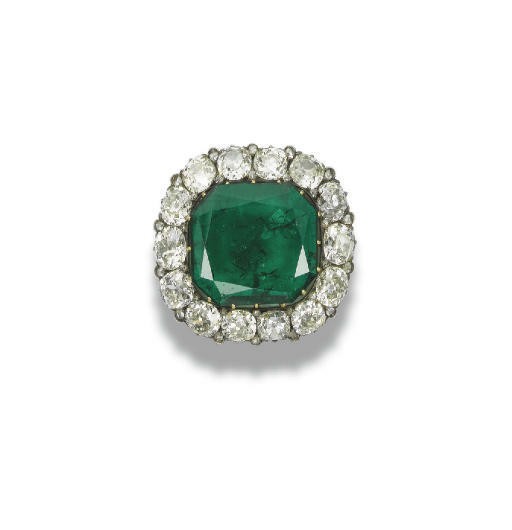 This entry indicates, without doubt, that following the lots in this sale, the emerald necklace and the brooch, belonged to La Païva, and when her husband remarried in 1887, he gave his new bride, the Countess Katharina, most of the jewellery which had belonged to his first wife. It was then handed down to their descendants. Unfortunately, we have not been able to trace the precise origin of these two jewels in the Boucheron archives; however, all the others included in the list of 19 December 1882 were actually made by Boucheron between 1878 and 1883, and it is possible that other jewels may have been ordered at Boucheron by the Countess before the year 1878. The necklace and the brooch may have been ordered before 1870, or between 1871, the year of their wedding in Paris, and 1875. But the discovery has yet to be made. Countess Henckel von Donnersmarck came back to Boucheron for the last time on the 14 March 1883. She ordered two special jewellery boxes with steel corners and Fichet locks for her pearl and diamond jewels. She also ordered three scarlet fabric covers for these two boxes and a third one which contained the coloured jewels. Her last order is a big maroquin leather bag, in which the three boxes could be placed in order to travel safely. On reading these lines it is very easy to imagine an older, but still beautiful, Countess Henckel von Donnersmarck leaving her Hôtel on the Champs Elysée (it steel exists at number 25) for her last trip to Prussia. Behind her walks her chamber-maid carrying the famous Boucheron leather bag, containing three Boucheron morroco boxes with still corners, filled with pearls, diamonds, rubies, emeralds, sapphires and turquoises. This treasure has been unknown for decades; and now some of the most important pieces are presented for the first time in 125 years. These are not simply amazing stones: they are the stunning souvenirs of a world long gone: the jewels of the most beautiful and famous women of the nineteenth century, the courtesans and countess of the Second Empire. Vincent Meylan and Christie's would like to thank Jean Christophe Bedos and the Boucheron archives for their help in researching this note.